Are You in a Battle? If there is one thing that I’ve learned from God, it is how to fight. The key: DON’T GIVE UP! Stand firm for the Lord and apply what we call “knee therapy” – get down on your knees and pray, pray, pray! Battles can appear to be frightening, exhausting, never ending, challenging, and full of mountains that just won’t move. Do you know what the beauty of God is like when you are in your battles? He walks you through it. And, the journey with Him, as well as the outcome, is always greater than anything you can ever imagine. God loves you so much and He is so full of surprises that even in the midst of the battles and your weakest moments, He will bless you. He will put the right things in your hands, the right Spiritual tools to comfort you, guide you and show you the way He wants you to go. What I love about God when I am in my battles, is His assurance that He is with you wherever you go. He will reveal Himself to you in sometimes small, sometimes big, but always in powerful ways. I also love how He teaches us to fight. It is in the way that the world cannot understand. In Ephesians 6, we wear His armor and we fight with truth, righteousness, peace, faith, salvation and the Word of God. Have you used these? Every single piece of the armor has the strength and power of God. Speak the truth, as only the Truth WILL set you free. Jesus said He is the Truth. Put on righteousness. Make sure what you do during your battle is morally right. Make no compromises. Walk in peace. God is in control and He has you in His righteous right hand where no one can get a hold of you. Remind yourself time and time again of where you are. You can rest in the Lord when you walk in peace. Take up the shield of faith. I’ve used Jesus as the shield between my battle and me. I’ve asked Him to step in front of me to protect me. He does. Protect your eyes, ears and mind with the helmet of salvation. Be careful what you see, hear and put into your mind. Finally the sword of the Spirit, which is the Word of God. Call out your scriptures and tell God what you are feeling and what He promised to do for you. Fight with the Word. Finally, the greatest weapon there is, is love. It breaks all chains and barriers. Learn how to forgive and just love, but learn from the Spirit. Heavenly Father, we bow before You to give thanks for Jesus. He showed us how to fight. In His life and crucifixion, Father, we can see exactly how Jesus used the Armor of God. We thank you for the Apostle Paul and for using him in such a powerful way. There are so many things that Jesus and Paul taught us, Father and we have seen from their lives, how to fight a good fight. Ephesians 6:11 Put on the full armor of God, so that you can take your stand against the devil’s schemes. 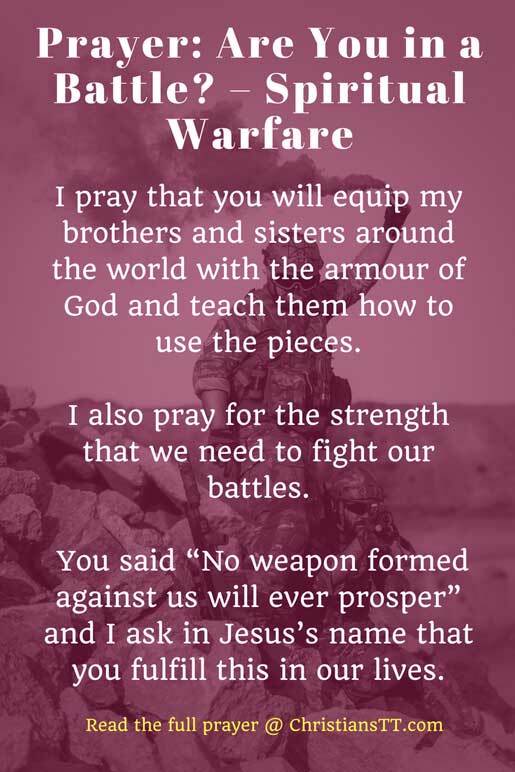 I pray that you will equip my brothers and sisters around the world with the armor of God and teach them how to use the pieces. I also pray for the strength that we need to fight our battles. You said “No weapon formed against us will ever prosper” and I ask in Jesus’s name that you fulfill this in our lives. Thank you for uplifting our bodies, minds and Spirits each and every day. In Jesus’s name we pray. Amen. 1 Pet. 5:8-9 Be self-controlled and alert. Your enemy the devil prowls around like a roaring lion looking for someone to devour. Resist him, standing firm in the faith.